With the quantum involved, curing cancer is a pertinent issue that has never gone off the desk of Healthcare practitioners or technology innovators. As of now, precision medicine is the highest level of aid that has been brought by the technology innovators for curing cancer besides advanced healthcare equipment. Precision medicine is a form of medicine which uses information about the patient’s genes, proteins, and environment to prevent, diagnose, and treat cancer. The Internet of Things (IoT) also has the potential to bring a huge transformation to the Healthcare industry. For the starters, it promises to reduce the emergency room wait time, track patient data accurately, and manage healthcare inventory. All these functions will improve the efficiency of the healthcare sector to an unimaginable extent. Artificial intelligence also holds a fair share in the future of technology in the healthcare sector. It is predicted that in future AI could assist doctors with cancer research, detection, and care. 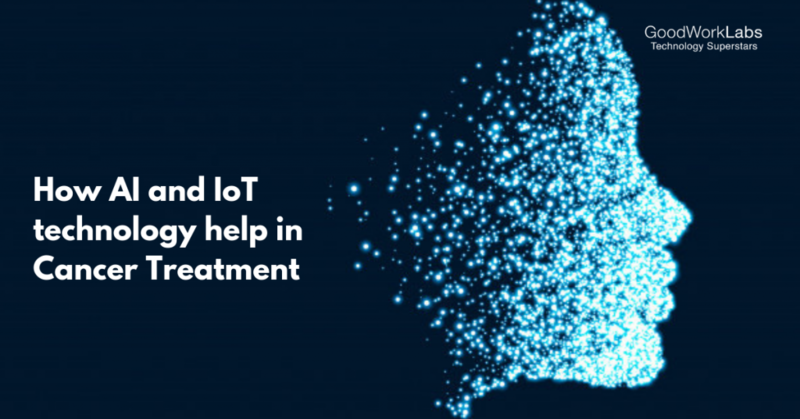 The combined forces of AI and IoT can help to cure cancer and save a considerable number of lives each year. Currently, AI and IoT are not functioning together in the cancer treatment space. IoT has brought revolutionary change in the healthcare ecosystem with its potential to aid with early detection of breast cancer: ‘iTBra’. The term is coined by the inventor of the connected bra – Rob Royea, CEO of Cyrcadia Health. In the era of wearable technology, this connected bra has revolutionary embedded temperature sensors which track changes in the temperature of breast tissue over time. This device uses machine learning and predictive analytics to analyze the collected data and classify abnormal patterns that could indicate early stage breast cancer. Women only require to wear it once a month for 2-12 hours while they carry on with their daily chores. No radiation or prodding involved. The iTBra can be worn beneath any normal bra and the results of the test will be transmitted to a smartphone. This device is a remarkable innovation and is far better than the traditional mammography which tends to detect the presence of cancer at usually at Stage 3 or 4. Also, the mammography produces a high number of both false-negative and false-positive results which makes it highly unreliable. This test is primitive and misses the presence of cancer in women with dense breast tissue more than 50% of the time. This false negative rate is reduced to 17.3% by the iTBra for all the tissue types. Apart from the breast cancer, a variety of early-stage cancer symptoms are vague and unrecognizable in other kinds of cancer. Clearly, the rate at which cancer goes undetected is very high. If the IoT systems work in tandem with the AI technology there will be a great jump in deciphering cancer systems and the patients will receive treatment before it’s too late. The intervention of AI is very important in the detection of cancers like mesothelioma which goes undetected in preliminary stages. Mesothelioma develops over a period of decades and is challenging to detect because early symptoms may manifest as a cough or discomfort in the chest or abdomen. With the help of AI, such trivial symptoms can be tracked over decades and the patients will be able to receive timely treatment. The patient’s journey can be made less painful and the life expectancy can be lengthened. While IoT can be used to generate sensor-driven data and insight, AI could be put to work with the metrics and predictions in safe drug delivery. The advent of latest technologies such as AI, Machine Learning, and IoT has brought hope in the healthcare sector for better treatment ways. The first step is already taken when the consumer technology companies have started creating wearable technology that can help detect and diagnose cancer. Also, governing authorities all over the world have taken initiatives at varying scales to support the flourishing technologies. Government-supported programs like the “Cancer Moonshot Initiative” is the best example of government initiatives towards finding a better cure for Cancer. With financial aid available, researchers are working on developing new treatments collaboratively. The National Cancer Institute has launched the Cancer Moonshot program which has brought together a big faction of doctors, researchers, pharmaceutical companies, and others. This program is expected to bring positive results and accelerate the cancer research by 2020. MarketResearch.com says that the healthcare Internet of Things market is predicted to hit $117 billion by 2020. In the same year, the combined IoT market will hit much more than $117 billion. By 2025, the same figure is expected to jump to $2.5 trillion for Healthcare industry, followed closely by the manufacturing industry at $2.3 trillion, says Intel. These are some promising figures which are showing the bright future of the Healthcare industry. The fusion of AI and IoT technologies would empower patients and healthcare professionals more than we have imagined. Thus, with the aid in metrics and predictions, AI will help doctors to make better data-driven decisions and IoT will provide the necessary technology to connect devices, data, and action which will assist in optimized drug delivery systems and early detection mechanisms.